The most recent developments in assisted reproduction [subzonal insemination (SUZI), (ICSI)] are used very successfully, especially in the therapy of male factor infertility (Van Steirteghem et al. 1993). 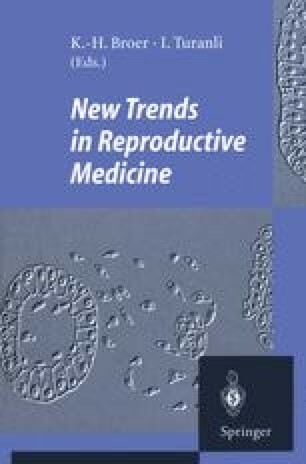 By these new techniques, male fertility disturbances can be overcome in patients who previously had no chance of achieving pregnancy, e.g., those with globozoospermia. Moreover, dogmas have been questioned that until recently were generally accepted, e.g., the role of the epididymis in sperm maturation, given that epididymal and even testicular spermatozoa have also been used successfully in the above-mentioned methods. Alternative possiblilites of drug treatment in andrology are very limited; those which were thought to be useful in the past, e.g., kallikrein, are doubted today (Glezerman et al. 1993). Consequently, at present, there is considerable uncertainty in andrology, so that the role of traditional andrology in reproductive medicine is questioned.